A superb addition to your open-air space, this upscale Galtech 6' x 6' ft. Square Wood Patio Umbrella is both stylish and elegant. With its stunning wood pole, that is coated with 6 layers of marine varnish to seal the wood, this outdoor umbrella is sure to handle even the toughest outdoor elements. The wide selection of premium Sunbrella and Suncrylic fabrics that are offered ensure that your umbrella canopy will compliment your open-air space beautifully. 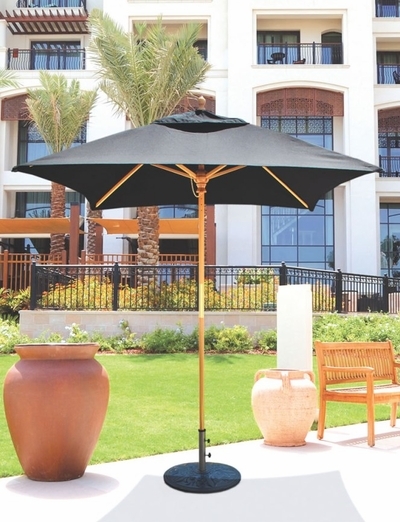 This wood patio umbrella ensures an enjoyable experience on the sunniest of days putting your relaxation time at a premium. * Shade Size: 6 x 6 ft.